This vintage St. Patrick’s Day postcard by Ellen Clapsaddle includes a lovely harp and an open scroll with the message: Let Erin Remember. 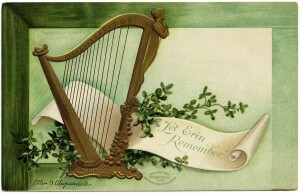 Vines of shamrocks are framing the scroll and harp. The illustration is all on a green and white background. Click on image to enlarge.